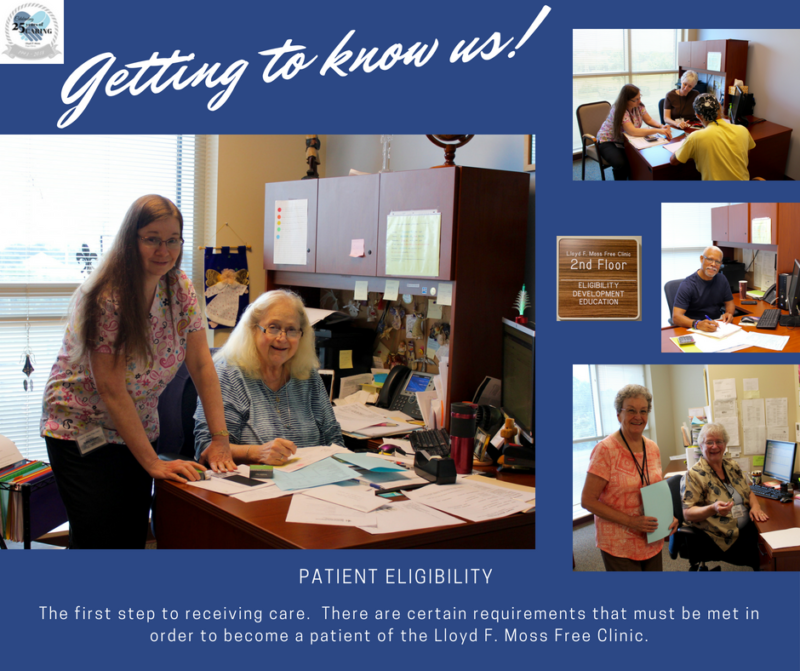 In its 25 year history, the Lloyd F. Moss Free Clinic has been built and sustained by our family of Patients, Volunteers, Donors and Community Partners. For 25 weeks of our 25th Anniversary year in 2018, we will share with you 25 photos that highlight our programs and services. Check for new photos here and on our social media platforms as we come together to keep our mission of providing healthcare, hope, and healing to the community alive! Learn more about, Harmony & Healing, our 25th anniversary celebration HERE! A special THANK YOU to staff and volunteers who allowed us to capture them, “in action”, during these last 25 weeks! 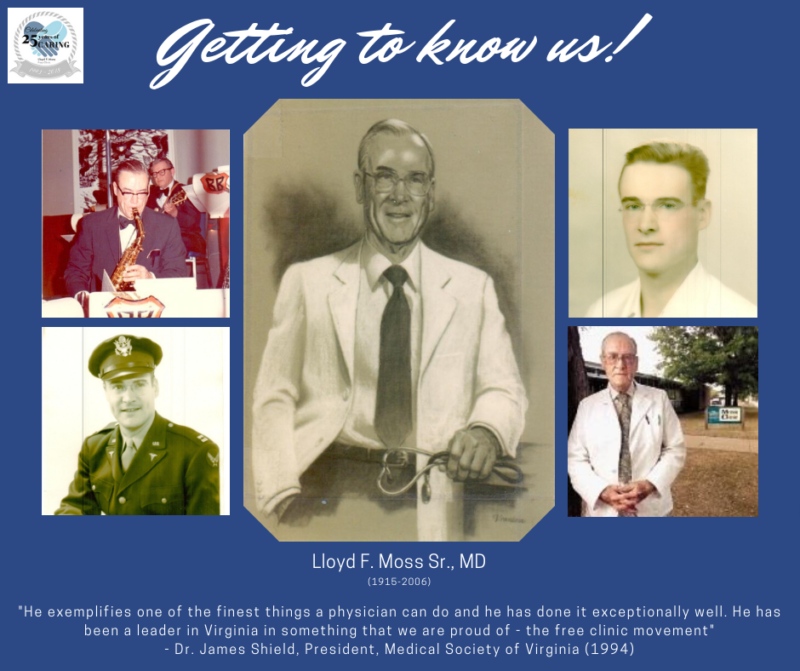 Lloyd F. Moss, Sr., MD (1915-2006) continues to inspire us all. A long-time Fredericksburg physician for whom our clinic is named, he spent decades treating patients and guiding fellow physicians. His concern for the underserved, his character and integrity, and his considerable talents were shared unselfishly with those in need. We are grateful and proud to carry on his legacy. Dedicated to Karen Dulaney, Executive Director, who has been with the Clinic for 23 years! Karen is one of very few who have seen the Clinic grow from its grass-roots effort into the community safety net and beacon of hope that it is today. Karen’s dedication to the Clinic and commitment to the people in need throughout our community is applaudable. Her contributions to the Clinic are undeniably tied directly to its success. We’ve come a long, long way! 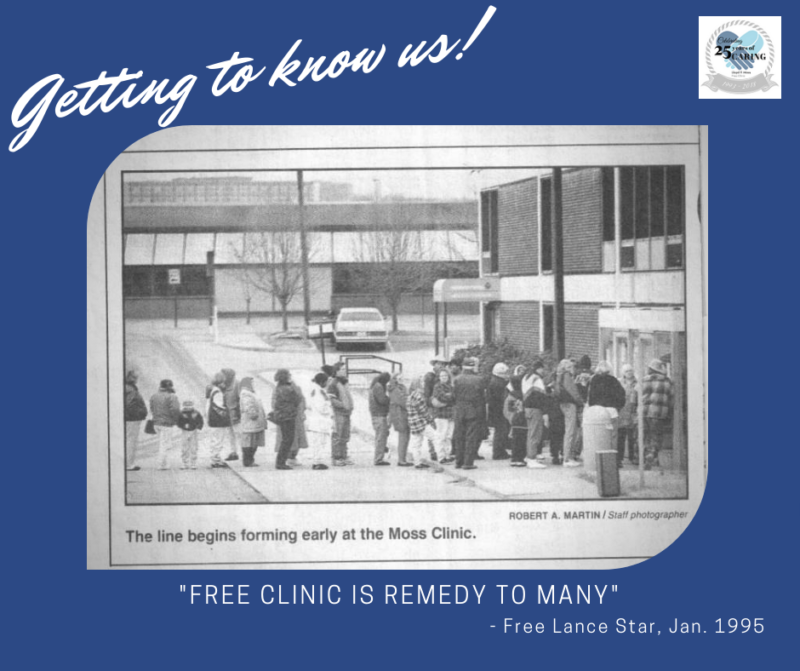 This photo was part of a front page article in the Free Lance-Star, titled “Free Clinic Is Remedy For Many”. In those days, the Clinic was a walk-in clinic, open only on Tuesday and Thursday evenings. The Clinic was in the Amy Guest wing of the old Mary Washington Hospital. (The wing was torn down in 1996 to make room for a bigger parking lot.) Patients would arrive hours in advance of our 5:30 PM opening time in order to secure one of the coveted 30 slots, often bringing a lawn chair so they didn’t have to stand! Fast forward 20+ years and the Clinic is now open 7-days a week 8:30AM-5:30PM, with evening hours on Tuesday & Thursday with most patients being seen through appointments only. No-one has to bring their lawn chair these days! We have certainly come a long way and intend to remain a beacon of hope to our neighbors in need for many more years to come. 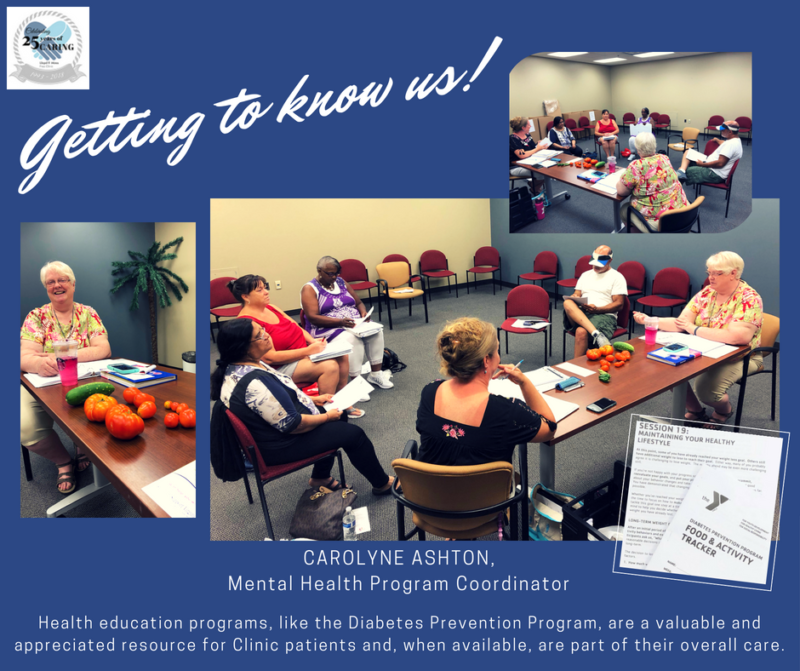 Getting to know us, is getting to know our community. Support for the Clinic and the people we serve comes in many different forms. We see it every day. 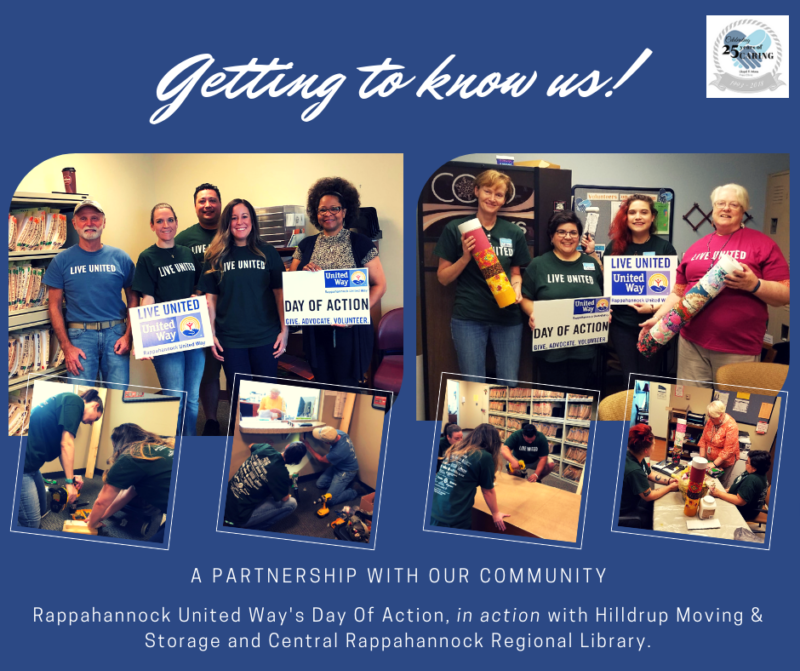 Last week, we were showered with hands-on help by volunteers from Hilldrup Moving & Storage and Central Rappahannock Regional Library through Rappahannock United Way’s Day of Action program. Thank you all who came out to help! 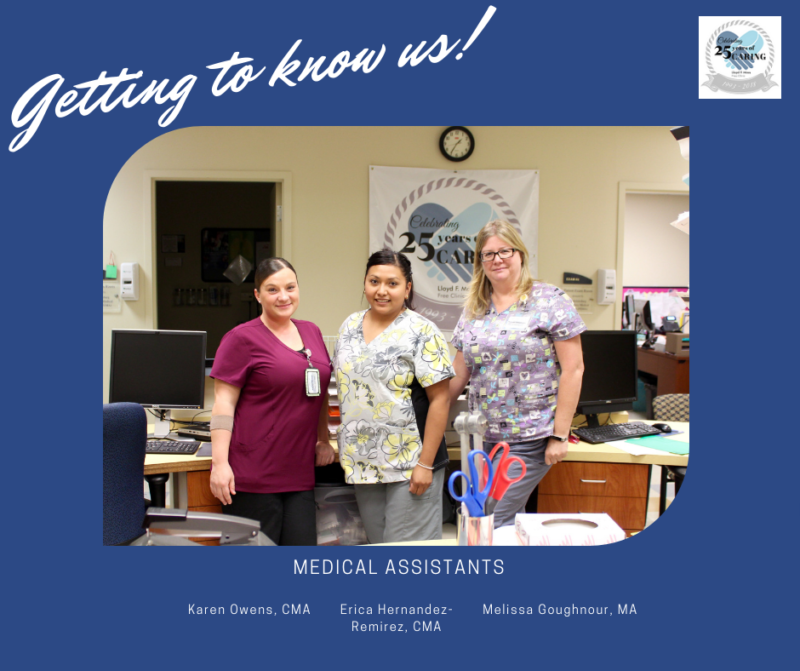 This mighty team of 3 Medical Assistants, along with the support of credentialed volunteers, is so instrumental to the flow of the Clinic. They work directly with our volunteer medical providers to ensure our patients are receiving timely, quality, compassionate, and complete care each and every day. 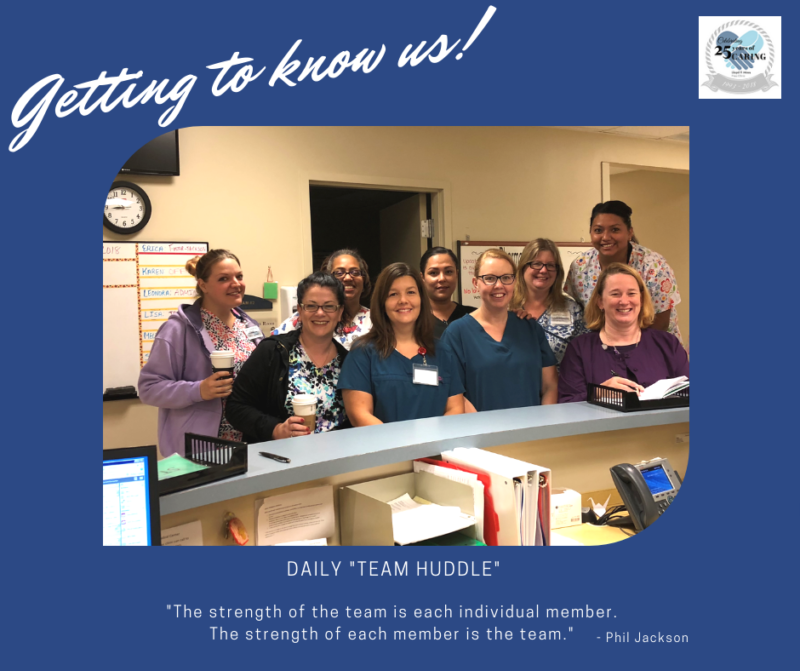 Led by Debbie Rhodes, Director of Clinical Operations, the medical team conducts daily “team huddles” at the start of each morning. This valuable time is used to promote open communication and provides a wonderful avenue for staff members to prepare themselves for the day. With coffee in hand, they openly address any concerns or questions about the day’s schedule and ensure that they have the tools/resources available to them right from the start. 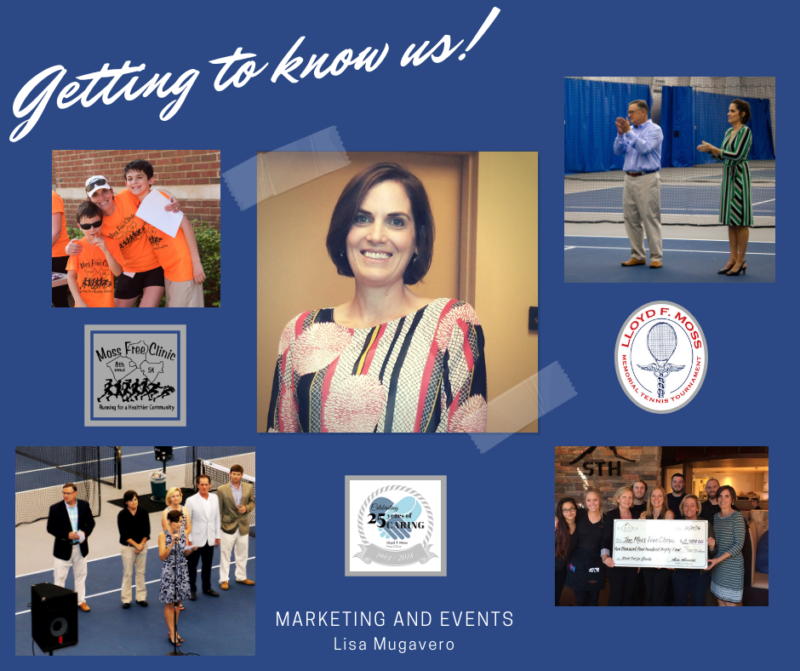 As our Marketing & Special Events Coordinator, Lisa Mugavero plans every facet of the Clinic’s fundraising and community awareness activities. 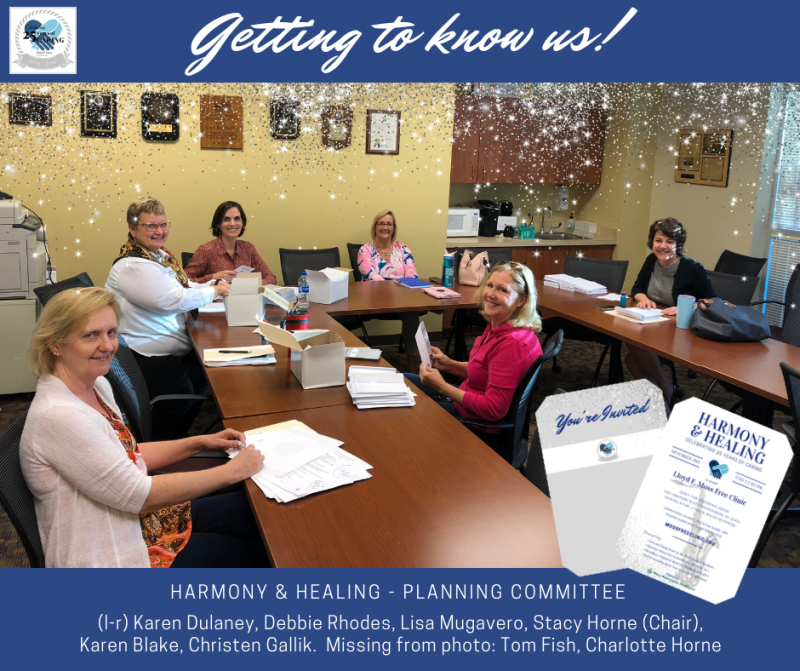 From our 5K Run/Walk and Tennis Tournament to our upcoming 25th Anniversary Celebration, she coordinates vendors, volunteers, catering and logistics to make it all happen for the benefit of the Clinic’s patients. 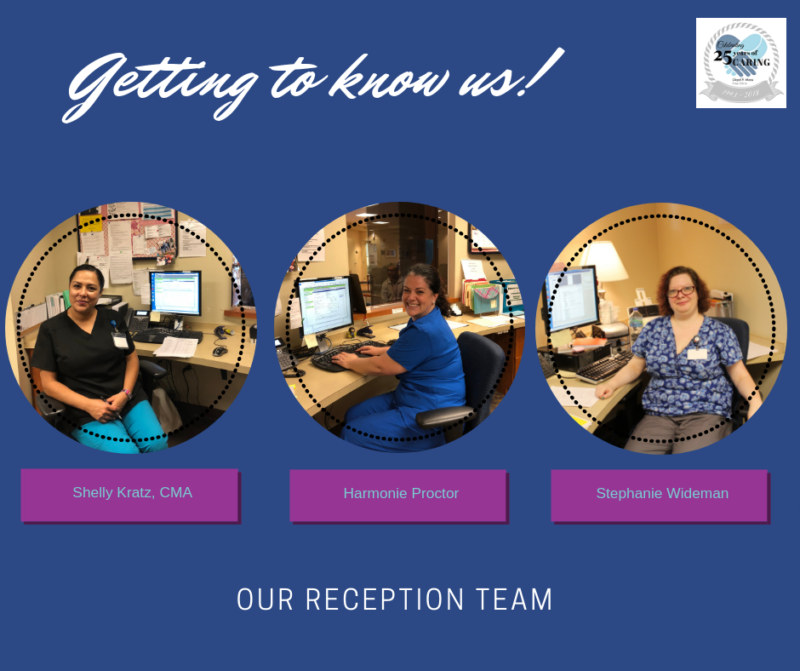 These smiling faces belong to our front desk administrative staff who manage the Clinic’s organizational and reception responsibilities, providing customer service to our patients, volunteers, and visitors. 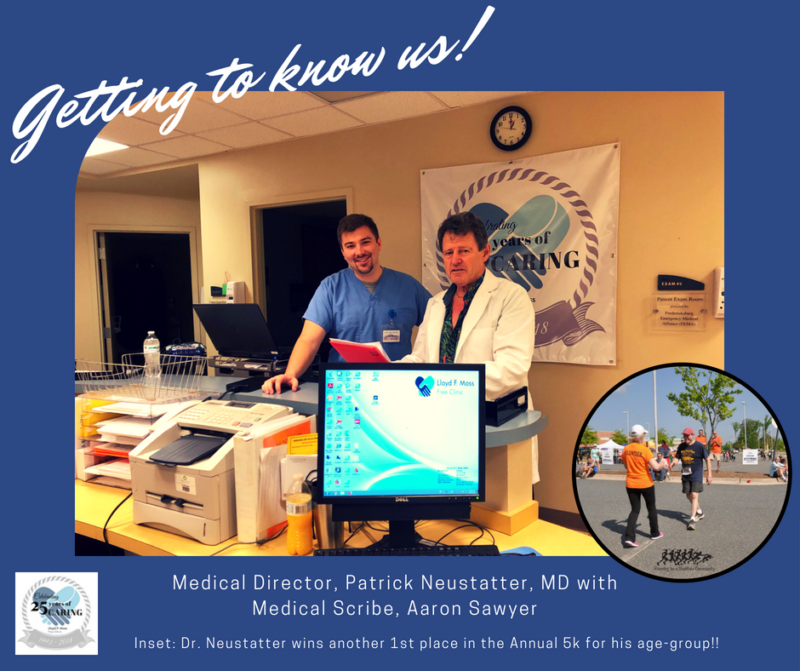 Dr. Patrick Neustatter, is not only a long time member of the Board of Directors, he is the Medical Director for the Clinic and provides countless volunteer hours of medical care to Clinic patients. He is a very familiar face around the Clinic and helps to keep everyone smiling. With the implementation of electronic health records a few years ago, the Clinic added a Medical Scribe position. Aaron Sawyer, along with his team of volunteers, works very closely with each provider to ensure patient records are updated accurately and efficiently, allowing the provider to focus on the patient. 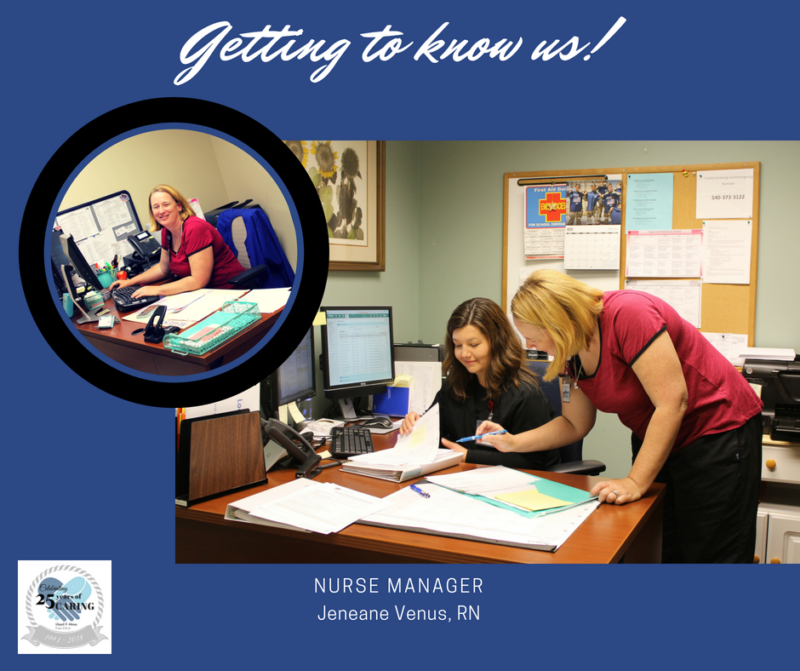 Nurse Manager, Jeneane Venus, RN, is relatively new to the staff roster and her role is to help make sure the Clinic runs smoothly each day. Working very closely with the Director of Clinical Operations, Debbie Rhodes, she oversees and supports the nursing team of staff, volunteers, and students. Pictured below, Jeneane is working with another new member of our nursing team, Lisa Burbee, RN. 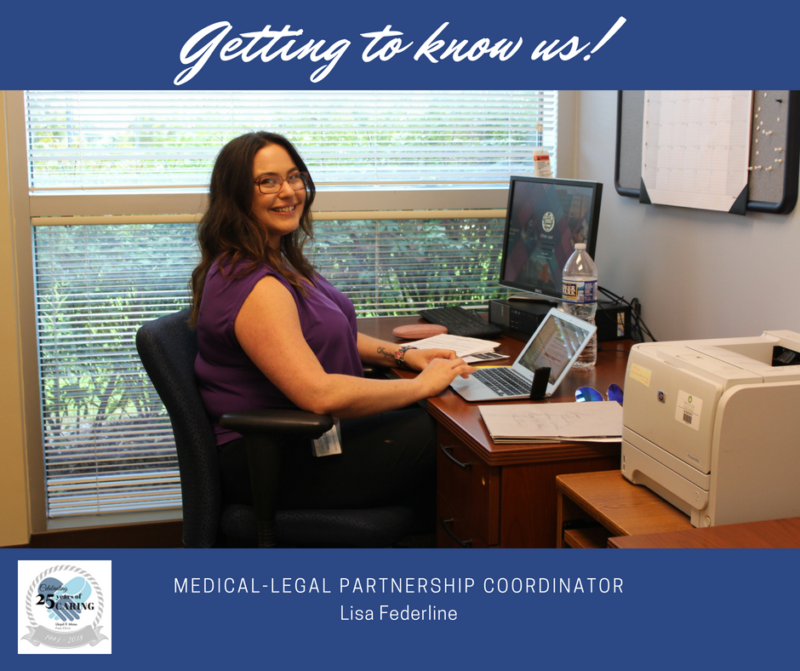 Grant funds from the Community Foundation of the Rappahannock River Region and our collaboration with Legal Aid Works are helping us plan a medical-legal partnership that will help address the health-harming legal needs of the Clinic’s patients. Lisa Federline, Social Worker, is guiding us through the strategic planning process of this initiative. Thanks to the many specialty care medical providers and local practices that generously donate their time, the Clinic is able to provide care in a multitude of specialty areas, including physical therapy, nephrology, gastroenterology, orthopedics, and gynecological care along with several others both on-site and off-site. 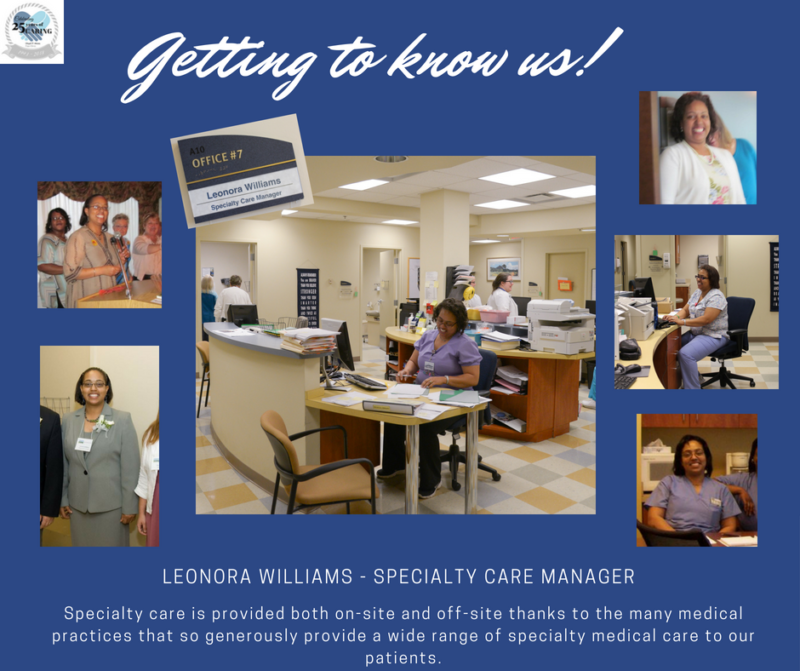 Specialty Care Manager, Leonora Williams, has been with the Clinic for over 15 years and is such a valuable team-player who, in her own words “just wants to help people”. We believe it! Her dedication to the Clinic is admirable and although she is often found taking her job very seriously, she has a notable laugh and a smile that will light up a room. Meeting with Eligibility is the first step to care. There are certain requirements that must be met before an individual can become a patient, including documentation of income and residency status. Eligibility Specialists, Donna Jadot and Ruby Cooper, have been screening patients for an honorable 17 and 8 years respectively!! Along with a core team of volunteers, they work tirelessly to ensure that our patients meet the requirements, often having to overcome many obstacles. It is their goal to ensure that someone who is deserving of the Clinic’s support is also getting it. 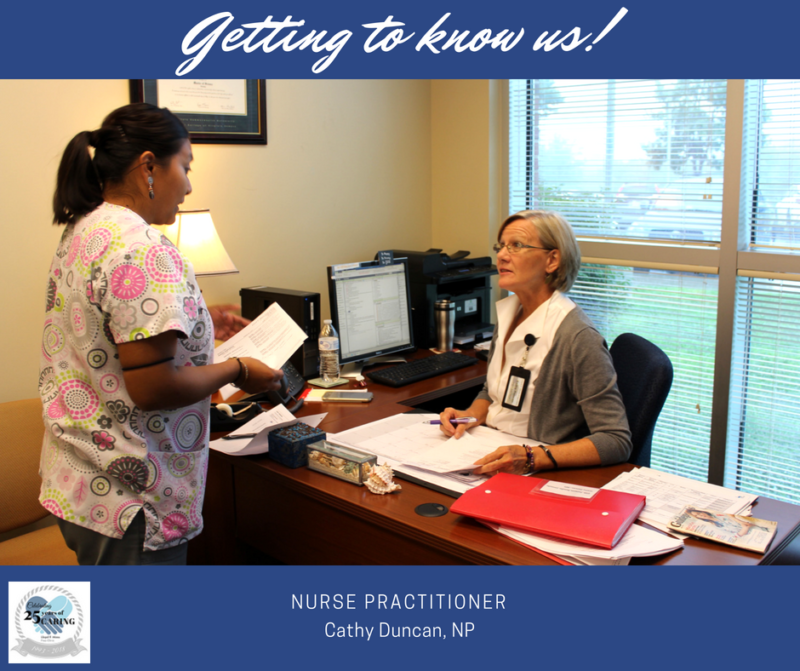 Nurse Practitioner, Cathy Duncan, known for her compassion and charisma, has been with the Clinic for just over a year. Working closely with other medical staff and volunteers, Cathy is dedicated to making certain her patients receive the quality and complete care that is deserved. We hear from her patients time and again how grateful they are to have her caring for them. And, we’re lucky to have her! Wellness and mental health go hand in hand. 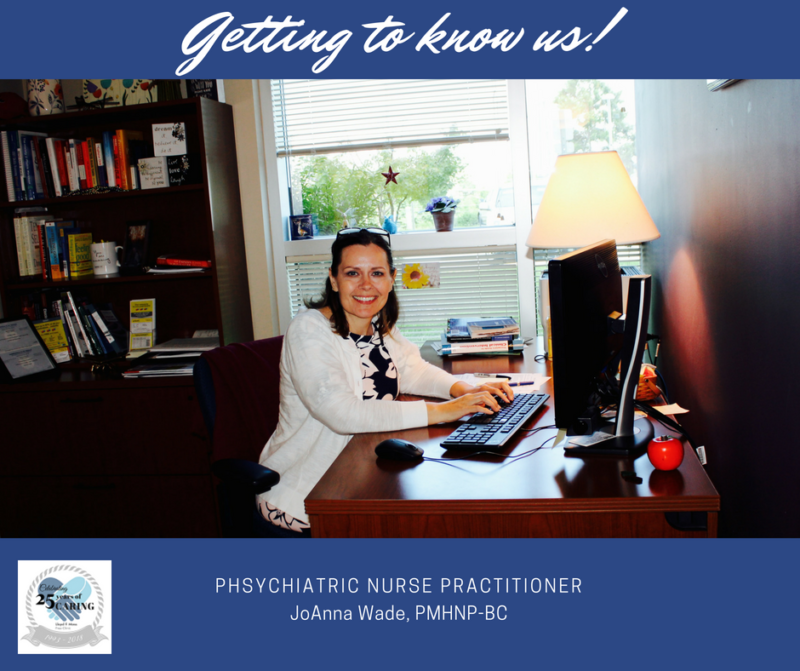 Through our growing number of volunteer mental health providers and staff Psychiatric Nurse Practitioner, JoAnna Wade, PMHNP-BC, we are able to offer thorough mental health counseling and treatment to our patients. Education is a key element of healthy living. Thanks to many volunteer health experts in our community and the resourcefulness of Carolyne Ashton, Health Education Coordinator, we are able to supplement our patients’ care with educational programs that present healthy lifestyle choices and reinforce methods to independently manage their condition(s) outside of the doctors’ office. “Health is a state of complete physical, mental and social well-being, and not merely the absence of disease or infirmity.” – WHO. The Clinic provides clinical experience for dozens of students each year through affiliation agreements with local universities and schools. Clinical workforce development is achieved through hands-on training and mentorship as outlined in the curriculum. 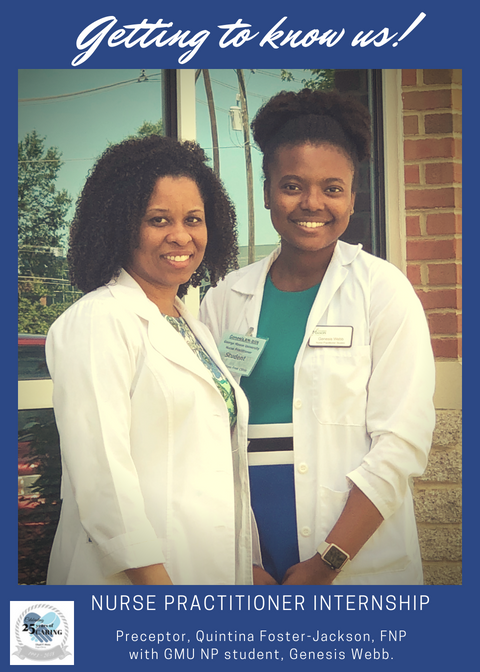 We are grateful for an outstanding student from George Mason University, Genesis Webb, who has been working with staff member Quintina Foster-Jackson, FNP this summer. The Clinic takes pride in the ability to operate as effectively & efficiently as any other medical facility and ensures staff is well equipped at all times through on and off-site training, plus continued education via online webinars and conferences. 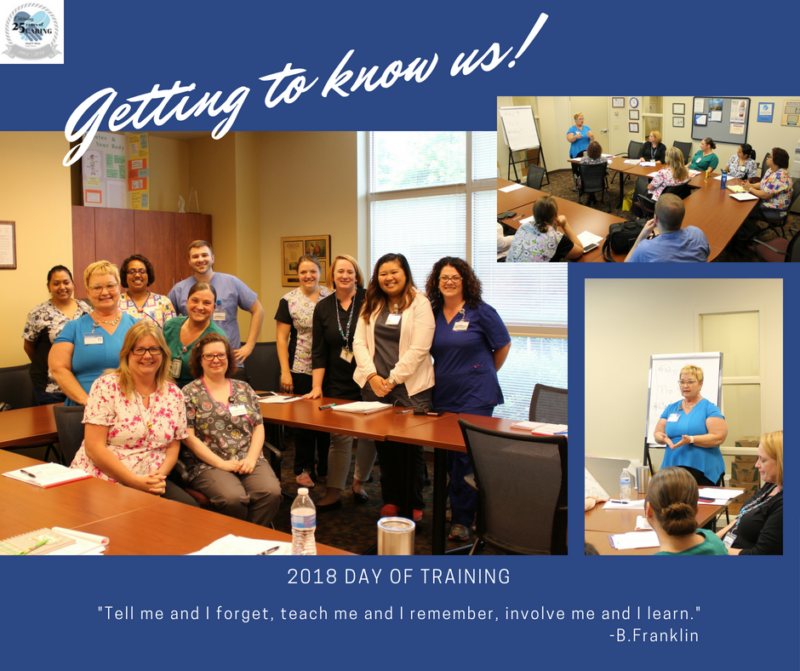 Debbie Rhodes, Director of Clinical Operations, recently rallied her team for a full day of refresher training. Included was a review of Clinic protocols and procedures as well as hands-on education about each department led by the Department Managers/Coordinators. “We make a living by what we get, but we make a life by what we give.” – W. Churchill. Andrea Springer-Collins, Volunteer Coordinator (extraordinaire! ), shines her enthusiastic smile on each and every one as they are first welcomed to the Clinic! 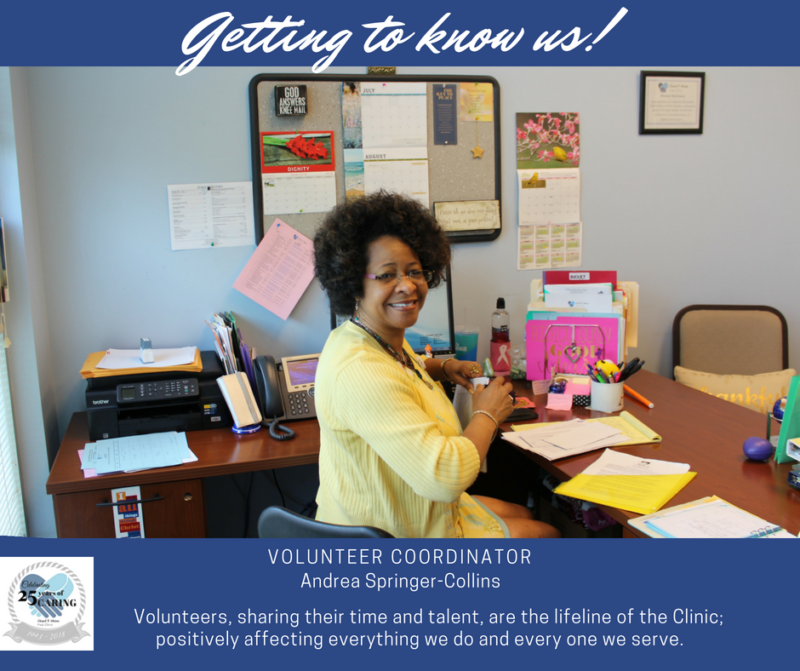 Relying heavily on volunteers, we are so grateful for all who share their time and talent with us, including licensed medical providers, administrative personnel, student interns and countless others who support all aspects of the Clinic’s daily operations. Collectively, we are a compassionate team with a common interest in helping others. Comprised of volunteers from diverse backgrounds, our Board Of Directors bring a myriad of experience, including leadership in healthcare, administration, government, accounting, and the private sector. 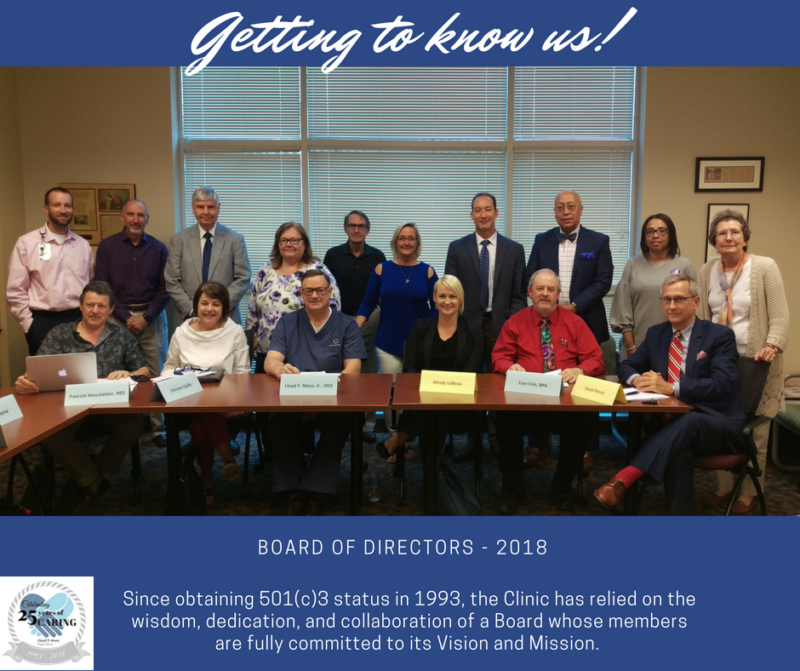 Since 1993, the Clinic has relied on a dedicated Board to ensure we can live up to our Vision and Mission. There is not much debate that oral health & overall health are fundamentally intertwined. 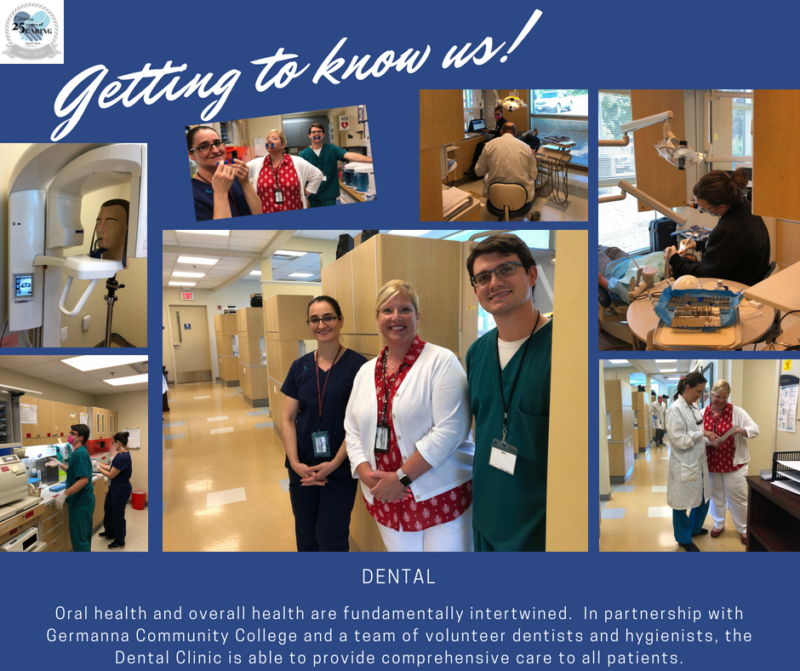 Thanks to a partnership with Germanna Community College & an amazing team of volunteer dentists and hygienists, the Dental Clinic is able to provide that kind of comprehensive care to our patients. Dental Care Coordinator, Kim Meredith and her dynamic team of assistants, Kleo Giannake & Ryan Stevenson are what keep it running like a well-oiled-machine (…er, well-brushed-tooth?!). 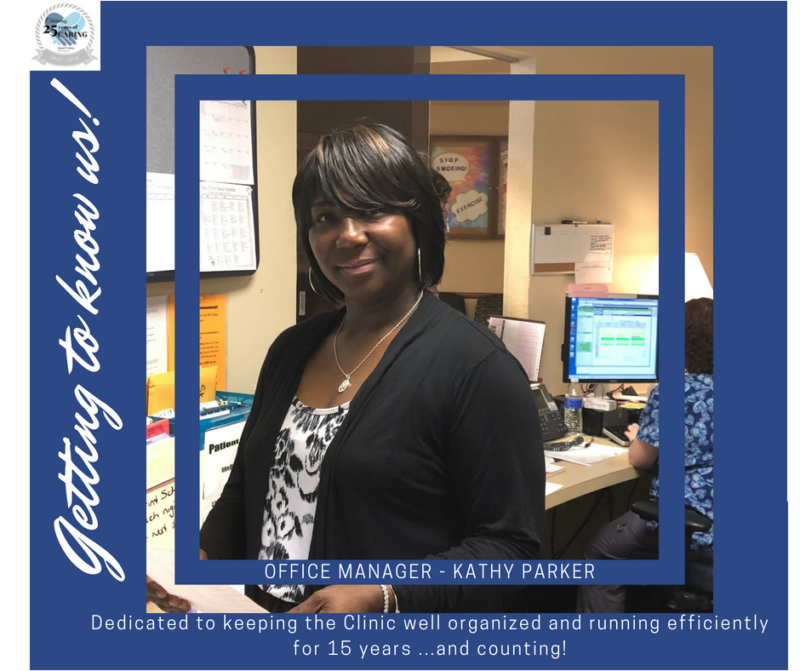 Dedicated and dependable, Kathy Parker, Office Manager, has been everything but the doctor and nurse over the course of her 15yr tenure! She keeps the Clinic well organized and running efficiently every single day. The Clinic’s on-site licensed pharmacy provides patients access to affordable medications that would otherwise be unattainable; it is a vital resource to the success of their treatment. 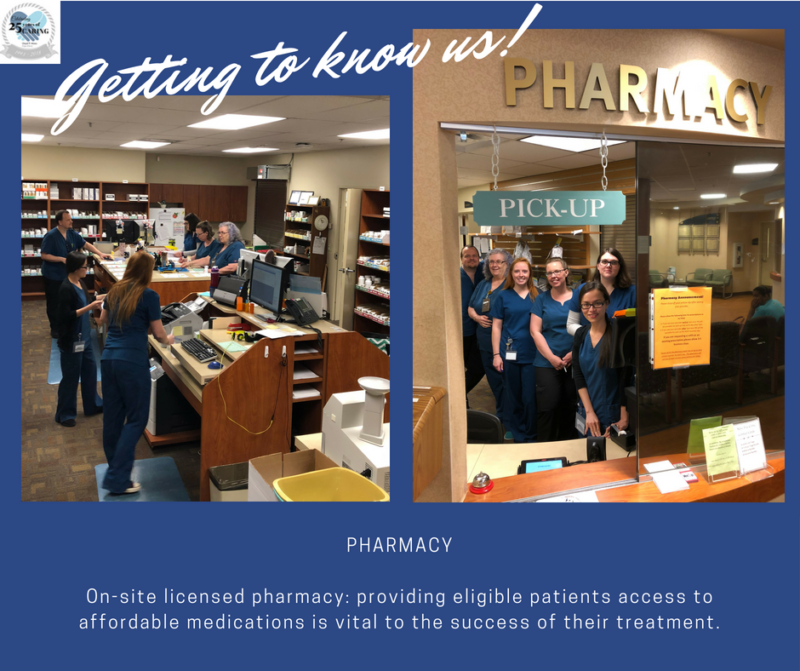 In addition to filling prescriptions, the pharmacy’s 6 staff members and many volunteers also act as patient advocates, and counsel and educate patients on their medications. They are an extremely valuable asset to the patients and are dedicated to the Clinic’s mission. In 2017, the pharmacy was selected to participate in the “AMP” (Access to Medication Program) by Rx Partnership, a program that utilizes the Clinic’s pharmacy to dispense medications to 6 other free clinics in VA. 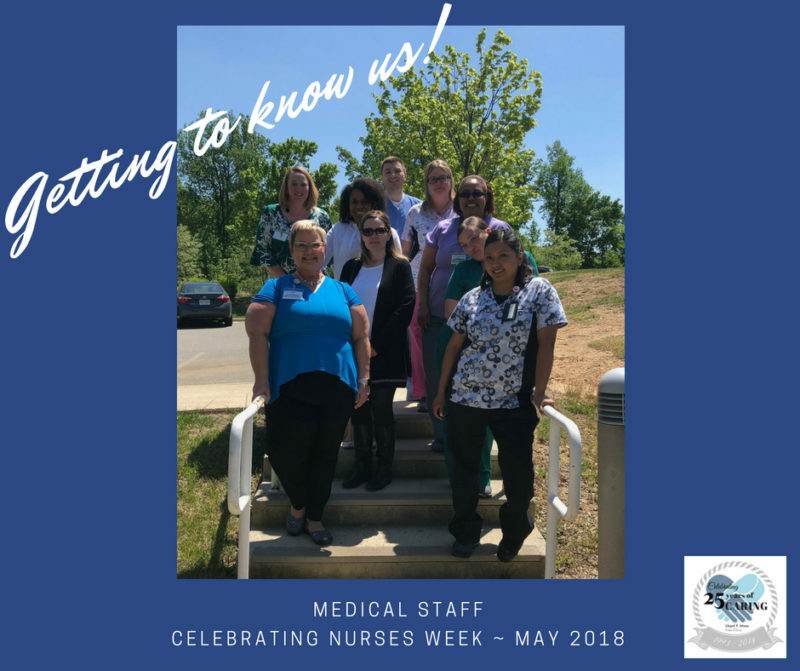 While celebrating during nurses week last week, we captured a moment with our amazing medical staff. We couldn’t do what we do with out them and the many clinical volunteers.